In Godina Jones’ home, three grandchildren circled her like planets. Planets that kept climbing up into her lap, sometimes all at once: crawling baby, young toddler, and long-legged two-year old gathered together by her arms. Their parents, Godina’s two adult children, slept in the other room, exhausted after long hours of night work. Both had recently moved back in with Godina to pool resources as they struggled to survive on low-wage jobs. But Godina herself was stretching every penny of her unemployment. She was worried that her lights and gas would soon be shut off. A few months ago, she had been diagnosed with serious sleep apnea and ordered to take leave from her job as a Port Authority bus driver. A C-Pap machine had begun to help, but then her 80-year-old mother’s kidneys failed, requiring surgery. Godina had been providing daily care for her during the many complications of recovery. Godina was carrying on a life-long family tradition of helping one another during times of struggle. During her own childhood, her step-father lost his job as a GM factory worker because of his failing health. The family was forced to move again and again: Arlington Heights, Garfield, Wilkinsburg, Homewood, Hazelwood… house after house, school after school, neighborhood after neighborhood. They lost many of the critical community connections that help so many families survive. I remember being in the house with my mom and step-dad with no electricity, no gas.… We used water for our cereal because we didn’t have milk.… We had no heat.” She remembers escaping from winter cold by sleeping for many hours. In her early twenties, Godina’s brother and father died in the same year. She had to leave school to care for her mother, and tried to make ends meet with a series of low-wage jobs. Godina says her children could have starved without food stamps during those years. Now her children are grown. Her daughter was recently a client of our free tax filing assistance program, which, thanks to the support of people like you, helps low-income workers climb out of poverty. In the past couple weeks, the health of both Godina and her mom has improved and Godina is back to driving her route. For most people who fall on hard times, poverty is not a permanent state. But a majority of Americans will experience at least one episode of hardship in their lives. It’s critical that a robust safety net is there to help get them quickly back on their feet. Only government has the power and wherewithal to end poverty and hunger. Only government can reach the tens of millions of Americans who have no resources to draw on when hard luck hits, who are stuck in low-wage work, or have limited incomes due to age or disability. Nonetheless, these programs have been under attack for decades, causing needless hardship and suffering. Sadly, the results of the 2016 election both nationally and in Pennsylvania mean those attacks will soon get worse. Godina knows this, and that’s one of the reasons she has joined Just Harvest as a passionate advocate. “I want to make sure that we don’t lose everything. We could lose so much.” We need to continue to fight for economic justice for all. Food stamps and tax breaks for low-income households are the two most effective ways to lift people out of poverty. 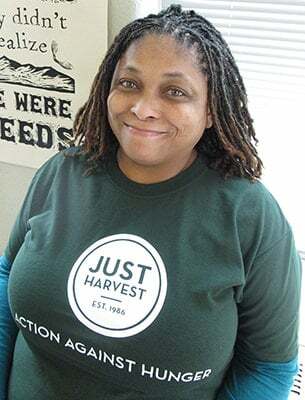 Your gift to Just Harvest today connects vulnerable people with vital government assistance programs, which we also work to strengthen and protect. With your support we can send a clear message to our legislators: safety net programs help people escape hardship and hunger. Godina will join us as we take that message directly to our elected officials in Harrisburg and Washington, DC. 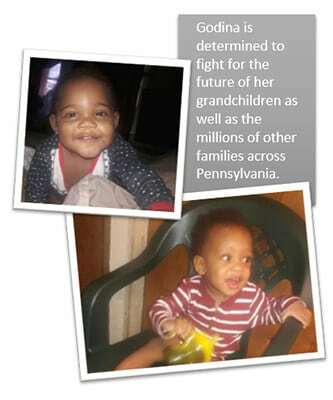 She will mobilize her community to stand up for the policies and programs that give those who are struggling a chance. Our voice to protect basic human needs must get louder; our movement must get stronger. If you haven’t already, please make a gift today to support our work to obtain economic and social justice for all.